This recipe is great for breakfast, but it also makes a nice snack or dessert. You can cook the quinoa the night before if you're having this for breakfast. Just reheat it in the microwave for about one minute before you put the parfait together. The total cost for two servings is only about $3.50, and potentially significantly less if you buy the ingredients in bulk. Cook quinoa according to package directions. Cover to keep warm. Peel apple and pear and cut into chunks. (You can leave the peel on if you prefer.) In a small bowl, toss fruit chunks with Stevia and cinnamon. Microwave, uncovered, for one minute. 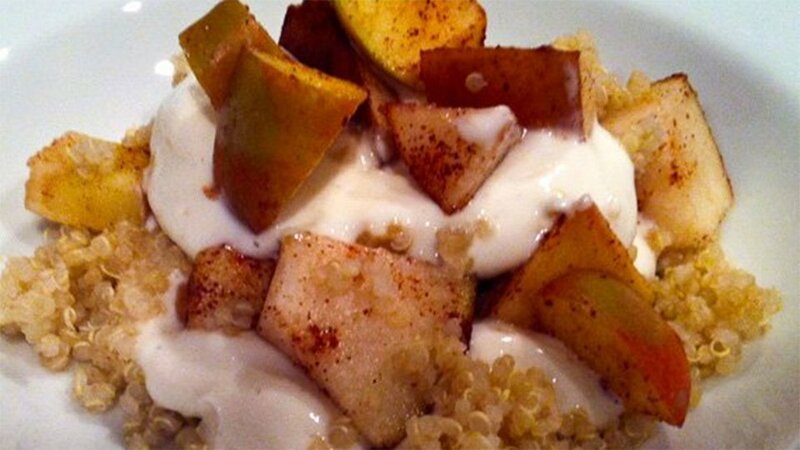 Spoon 1/4 cup quinoa each into the bottoms of two bowls or dessert dishes. Add 1/4 of the fruit and then 1/4 cup Greek yogurt. Add another 1/4 cup of quinoa to each dish, and another 1/4 cup yogurt. Top with remaining fruit and serve.